Set in the Shetlands, this novel's hook is the murder of a teenager, an incomer to the islands. It's packed with psychological suspense, compelling characters and lean prose, making it a real page turner! It's an old chestnut, said many times before that contemporary crime fiction holds up a mirror to contemporary society. In this novel, we get to know the victim from the police investigation and from the scenes involving family and friends. We discover that Catherine Ross had one immediate ambition in life and that was to hold a mirror to the society in which she found herself and to prove that it doesn't matter where you are in the world, people are always the same. This is also true of Ann Cleeves with this remarkable novel, where she illuminates, what is to some a peaceful holiday destination, and identifies that human life in a town or city is not so different to human life in such a serene, but in reality, hard working location. There quite a few characters in this novel, but they are so well drawn and individual that it is impossible to lose track. The horror of prejudice is seen through the eyes of a victim and the eyes of the insecure, who are looking for an easy explanation and an easy resolution. The way life has changed over the last sixty or so years is also in evidence, portrayed sympathetically, with a keen eye on changes in culture and values in society. As a writer, Cleeves is spot on and respectful to her readers. There is no cheating to be found here. The cast of suspects for the murder is wholesome - (this is like multi-seeded whole meal bread as opposed to a standard white sliced); but, I am pleased to say that there is one brilliantly placed clue within the novel that will satisfy the reader, if noticed. (Don't blink and stay aware of every word - it's there for you to find!) Also resolved, as I had suspected, is the old mystery of the child's disappearance and not how you might imagine. It's a set of islands full of secrets within its communities, and Cleeves taps into it with a keen eye, great imagination and superb storytelling. There is more than one mystery to solve within this novel, thanks to Cleeves and all are compelling and expertly resolved. 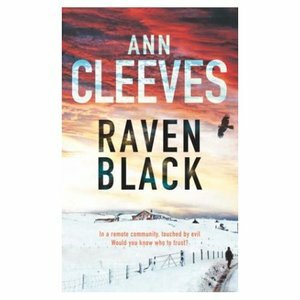 Ann Cleeves is an accomplished writer, but is also someone who is yet to get into the bestsellers' lists. I hope this award winning novel brings her the recognition she deserves. "Raven Black" is a novel of the quality that should get noticed and eventually make it to screen. Cleeves, in her prose, makes the setting very visual and I think this novel, superb as it is, also lends itself to a great TV presentation over two parts and two to three hours. Cleeves is also a member of that remarkable band of UK authors who joined together to form "Murder Squad". Please read the novel and please follow all the links; there's a great source of crime writing out there that is yet to be tapped to its full potential. Finally, congratulations to Ann, a worthy winner of the inaugural Duncan Lawrie. "Raven Black" really is such a good novel. Not to be missed - and then get the backlist! Sorry mr/mrs/ms Jones, but it's now so long ago, I can't be precise. It was all down to what one character said at the time of being questioned by the police/interviewed by them/chatting to someone else. The tense of the answer was wrong for me, if I remember rightly, but I cannot be sure on that. read the book but missed the clue, what is it? I'm in a book group and don't have time to re read it. enjoyed it very much though. Good to know you enjoyed "Raven Black" too. That's another endorsement for Ann Cleeves. Echo Park more than equalled his previous... And the 'blurb' published on Amazon at the beginning of the year bore very little resmeblance to the finished article! Chris, with such a quick whizz, I take it that Echo Park is Connelly's usual exemplary standard? I like the sound of the 'clue'. Yes, I do have a copy of this in the tbr :-). Must bump it up higher. Many thanks for this review, sounds a deserved winner.